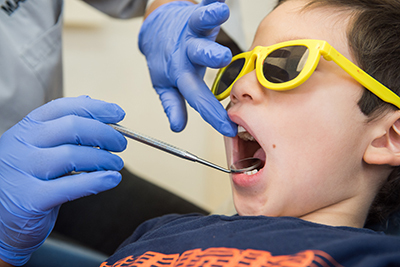 Now and then, children need extensive dental care that goes beyond the routine checkup and cleaning appointment. When oral surgery is a necessity, you need a team of experienced pediatric dentists who can work efficiently to minimize the potentially negative experience for your child (or you as the parent)! It’s not always possible to repair badly damaged teeth, especially if they are primary (baby) ones. If severe decay, fractures or an emergency prevent us from placing a filling or crown, the tooth may need to be removed to avoid the spread of infection. Teeth are also extracted when they interfere with normal tooth development or atypical biting patterns that have to be corrected with braces. Sometimes teeth don’t erupt like they ought to. To help your child’s tooth come in properly or guide it with orthodontic appliances, we may choose to expose it; to do so, we use a soft tissue laser. Lasers offer faster healing and minimal discomfort, making oral surgeries less invasive for our young patients. Another type of laser surgery that we offer is a gingivectomy or gingivoplasty. Such procedures are used to remove excess gum tissues or overgrowth of gingiva. If your child has fibrous tissues along the gumlines, a laser can easily remove them for a healthier, more aesthetic appearance. We want your child’s experience in our office to be one that they feel comfortable about. Because oral surgery can be intimidating, we make sure to incorporate analgesic and sedation options that help your child relax throughout the procedure. Our child-friendly team will create an environment where your family is well looked after at all times. Schedule a consultation today to find out how we can make your child’s next oral surgery a smooth experience.